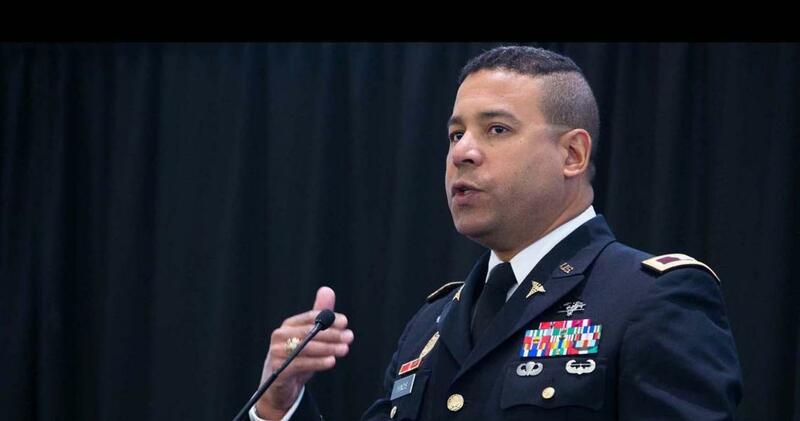 Colonel Sidney R. Hinds II, M.D., U.S. Army, was the keynote speaker at the inauguration of NJIT’s Institute for Brain and Neuroscience Research. In recent years, research into the myriad complexities of the brain and neurophysiology has gained momentum at NJIT across diverse disciplines, including biology, biomedical engineering, mathematical sciences and computing. With the formal inauguration of the university’s Institute for Brain and Neuroscience Research (IBNR) in March, the efforts of NJIT researchers to increase basic understanding of the brain that could lead to new healing therapies for related injuries and disease will be more sharply focused and closely coordinated. As the primary home for all neuroscience initiatives at NJIT, the IBNR will serve as an umbrella and organizing framework for collaborative research and training in areas ranging from brain injury, to neural engineering, to neurobiology, to computational neuroscience. Researchers will investigate, for example, how specific behaviors are generated in the nervous system, the mathematical modeling of neural patterns in bacteria, animals and humans, and innovations in brain imaging and neurorehabilitation, among others. In opening remarks at the IBNR inauguration ceremony held in the Campus Center, NJIT President Joel Bloom offered a succinct summary of the new institute’s working environment: “Very talented people working in teams across disciplines to solve very challenging problems.” This perspective was similarly reiterated by NJIT Provost Fadi Deek, Professor of Biomedical Engineering Namas Chandra and Professor of Neurobiology Farzan Nadim. Chandra and Nadim, both distinguished researchers, are co-directors of the IBNR. Professor of Neurobiology Farzan Nadim (left) and Professor of Biomedical Engineering Namas Chandra, co-directors of NJIT’s Institute for Brain and Neuroscience Research. “Establishing the IBNR is a milestone of superb collaborative synergy among faculty, staff and students,” said Atam Dhawan, NJIT’s vice provost for research, in his welcoming remarks. At NJIT, as Dhawan explained, this synergy integrates numerous related efforts across disciplines and research centers. It will also make the IBNR a focal point for collaboration with a wide range of other institutions and funding organizations. Cooperation in working toward common goals in brain and neuroscience research already involves Rutgers University-Newark, Rutgers Biomedical Health System, part of Rutgers New Jersey Medical School, the Brain Health Institute at Robert Wood Johnson Medical School, and the Kessler Foundation. The National Science Foundation, the Department of Defense, the U.S. Army Research Laboratory and the Kessler Foundation are among the organizations providing funding for research currently underway. The audience of some 200 gathered for the formal inauguration of the IBNR, which included brief presentations of research by faculty and students and a tour of campus research facilities, reflected the inclusive outreach of the IBNR initiative. Commenting on the perspective of his own institution, Sussex County Community College President Jon Connolly said that a key goal at his school is to provide students who want to eventually attend NJIT with the physical resources and solid grounding in the STEM disciplines relevant to successful participation in research such as that going forward at the IBNR. The keynote address at the inauguration was given by Colonel Sidney R. Hinds II, M.D., U.S. Army. Currently, he is the coordinator for the Brain Health Research Program for the Department of Defense (DoD) Blast Injury Research Program Coordinating Office and medical advisor to the principal assistant for research and technology, Medical Research and Materiel Command, Fort Detrick, Maryland. He has also served as the national director for the Defense and Veterans Brain Injury Center. “We do have state-of-the-art science and critical care but we need to standardize our approach and better utilize what we know. We want to go from good to great,” Hinds said. Going from “good to great,” he explained will require comprehensive investigation of what he termed the “neurotoxic cascade” of brain injuries — the nuanced, complex impacts on the anatomy of the brain and our neurophysiology. This includes gaining a more comprehensive understanding of the unique challenges presented by mild, or concussive, TBI, which are the majority of such injuries. Commenting specifically on the establishment of the IBNR, Hinds spoke of how it will build on research that NJIT is already doing in collaboration with the DoD and other groups. He characterized the IBNR as a place where “geographically disparate, perhaps mission-disparate, organizations can be brought together to best utilize available resources to answer critical questions about traumatic brain injury and neuroscience.” Under the leadership of Directors Chandra and Nadim, Hinds said, the IBNR will be a place where “shared experiences, shared resources and shared research” can be strategically focused on identifying critical gaps in our knowledge and then prioritizing and initiating efforts that can fill those gaps. As part of the inauguration of the Institute for Brain and Neuroscience Research, Raj Gupta (left), deputy director and senior science advisor for the U.S. Department of Defense Blast Injury Research Program Coordinating Office, Colonel Sidney R. Hinds II and Namas Chandra, IBNR co-director, discussed promising research that will be advanced by the new institute with NJIT faculty and students. Commenting on the relationship between NJIT and the Department of Defense, Gupta said that NJIT researchers have a special understanding of the needs of U.S. service members with regard to brain injuries, and a commitment to collaborative work essential for both new insights into basic physiological mechanisms and better treatment.